There are so many great bubble tea powders to choose from, but what is the secret to making great bubble tea with powder? The first step is to use a quality powder. This should be an obvious step. You can try to get the powder at your local China Town or you can order some online. Once you have found quality powder and tapioca (boba), now you need to get your method right. Bubble Tea can be made with many different bases. Green Tea, Black Tea, Earl Grey or even water. The base will change the taste of the drink and some flavored powders are better with certain bases than others. One of my favorites is Jasmine Green Tea with Taro Tea powder! Once your tapioca is cooked (click here for how to cook tapioca) now you need to brew your tea. (If you’re using water as the base, then just skip this step.) It is absolutely imperative that you use HOT tea when mixing your Bubble Tea Powder. Otherwise it won’t dissolve completely and will end up lumpy! For a single serving, boil 350 ml (12oz) of water and add 6 grams of Green Tea. Let it brew for 4 minutes. This will make “double strength tea” because you will be mixing it with ice later which will dilute it. Scoop out 2 scoops of your flavored powder and put it into your shaker. Add about 1/3 of the HOT tea and stir until the powder is completely dissolved. Now add ice until the shaker is 1/2 full, add the rest of the tea and now shake it all up. You want to shake it for at least 6 seconds to mix it all up. Now pour it over your tapioca pearls, grab a fat straw and enjoy! Making Bubble Milk Tea is a skill similar to being a barista or bartender and there are many different ways to make bubble milk tea. This recipe focuses on how to make real bubble milk tea with no flavored powders. If you want to perfect your bubble milk tea making skills with flavored powders, click here. First you have to find some tapioca balls. You can get these from your local China town or order them from our site. Put 1000ml(4 1/4 cups) of water into a pot and bring it to a boil. Put 100 grams of the tapioca balls into the water. Once they begin to boil, stir them and start a timer for 25 minutes. Now that the tapioca balls are cooking, it’s time to make the sugar water. Sugar Water: Mix 25ml of hot water with 25g of brown sugar(if you don’t have any brown sugar you can use white sugar and honey). Stir this until the sugar is dissolved and then put it in a bowl. Once the timer goes off, turn off the heat and let them sit for 10 minutes with the lid on. After 10 minutes, put the tapioca balls into a strainer(colander) and rinse with cold water for about 2 minutes or until the tapioca balls are no longer hot. Let all the water drain from the strainer and put them in the bowl. Let them sit for 15 minutes in the sugar water. **Notes: These cooking times are for medium sized tapioca balls. If your using smaller ones then reduce the time to 5 minutes. Increase the time for 15 minutes for larger ones. That’s it! Divide them up into glasses and add your tea. You can use whatever tea you want but I prefer black tea with milk. A good ratio is 50/50 for the milk and tea. Now that you know how to make the tapioca balls or boba, we’ll show you how to make milk tea to add to your boba! Boil 1 liter (1000ml) of water in a tea kettle or a pot. Add 20 grams of black tea leaves or 5 tea bags. Fill a glass or shaker half full with ice. Pour in the tea (half of the cup). Stir or shake vigorously for 10 seconds. Add milk to the top. 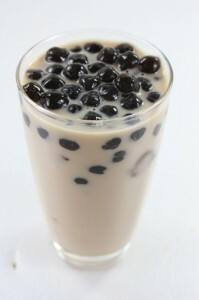 Now pour into your bubble milk tea into a glass(with your boba already in the bottom). Put in a fat straw(optional), Serve and Enjoy!